'Culturomics' does not exist. As far as I'm concerned, if it isn't on Wikipedia, it doesn't exist. However, it is listed on Wikipedia's Word of the year for 2010 under the designation 'Least likely to succeed'. As an amusing side note, it also says this: Most Unnecessary: refudiate (Blend of refute and repudiate used by Sarah Palin on Twitter. The laughs. Quantitative Analysis of Culture Using Millions of Digitized Books was published online december 16th 2010, and in print January 14th, 2011. Unfortunately, 'culturomics' does not appear in the title. Big mistake. Twice in the abstract, 17 times in the paper (including 'culturomic' and www.culturomics.org), but not in the title. Tsk. Clearly there is a correlation between 'Bjorn' and 'pleiotropy', as there should be. That this trend takes off in 1940 is of course curious (should be 2008), but I'll take what I can get (that only (4% of all) books are parsed is another important detail, I guess). And I'm just not going to comment on the fact that people can't spell 'Bjørn'. Even before the origin of the Modern Synthesis of evolutionary biology in the 1930's, interest in evolution waned, and neither 'the cell' nor 'bacteria' was enough to revive interest. 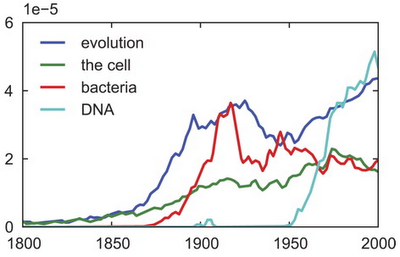 Then came along 'DNA', and 'evolution' picked up again, and has been increasing ever since. And so it is. Our understanding of evolution is contingent upon what studying DNA has taught us. It has revolutionized biology, and now pervades evolutionary biology. Without DNA, I would be without a job. Or this job, at least. Victory in the whaling wars?